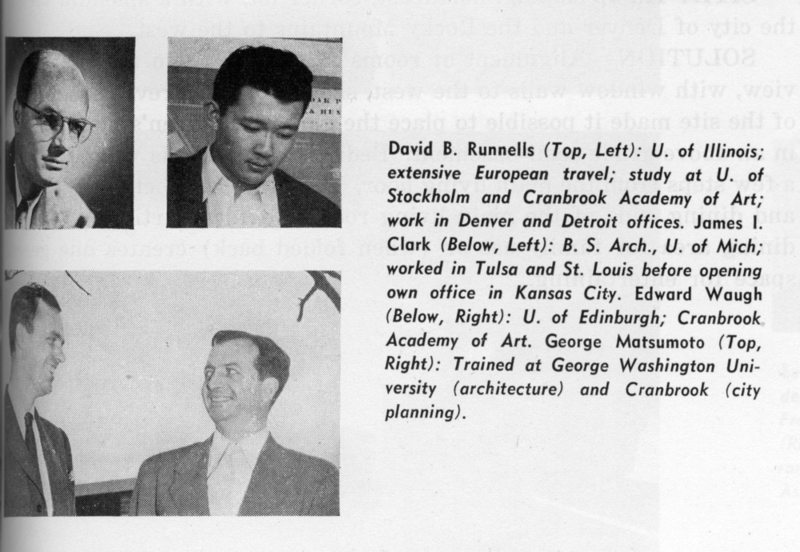 Architect David B. Runnells traveled extensively in Europe after graduating from the University of Illinois. He was heavily influenced by the work of Alvar Aalto while traveling through Finland and Sweden on a scholarship to the University of Stockholm. After returning from abroad, Runnells was a student of Finnish Architects, Eliel and Eero Saarinen, studying city planning at Cranbrook Academy of Art. At that time Cranbrook, located in Bloomfield Hills, Michigan was a hotbed of modern design education. Other students attending at that time were Charles and Ray Eames, Florence Knoll, Harry Bertoia, and Jack Lenor Larsen. Runnells was chosen to stay on in the Saarinen offices into the first part of World War II and was known to have worked there on the groundbreaking Crow Island School in Winnetka, Illinois, the Smithsonian Washington, D.C., competition, and wartime workers’ housing. In addition, he did competitions with co-worker and Case Study House architect Ralph Rapson. Runnells eventually settled in Kansas City sometime around 1943 as head of the industrial-design department of the Kansas City Art Institute. He was a director of planning with the Kansas City Planning Department from 1943 to 1946. He became a licensed architect in 1946 and partnered in Runnells, Clark, Waugh & Matsumoto, Architects. George Matsumoto was also a Cranbrook and Saarinen-office alum. Together, they did one of Runnells’ best-known projects, the new art-school building for the Kansas City Art Institute. The only other project known to have come from that firm was a house for partner James I. Clark. After the partnership dissolved, with Edward Waugh and George Matsumoto leaving to teach, Runnells went on to do merchant-builder home designs and custom homes, many of which were built by modern builder Don Drummond. The Revere Homes are his best-known merchant-builder design. The Reed Residence is the best surviving example of his large custom residential work. The two custom personal residences that he designed for himself and for Don Drummond have both been demolished. His 1966 design for the Alpha Kappa Lambda fraternity in Lawrence, Kansas, has also been demolished. Runnells taught at the Kansas City Art Institute and the University of Kansas during his career. Later in his career, Runnells was an ardent crusader for responsible city planning in and around Kansas City, championing for controlled growth and inner-city redevelopment. His unbuilt project for the massive Crosstown Center, to be located where the Power and Light District is now, was typical of the grand urban redevelopment schemes of the late 1960s and ’70s. The Kansa`s City Star called it a city within a city.